FTP Scheduler automates FTP uploads and downloads and scans for new tasks every 10 seconds (realtime FTP). The scheduler is easy to understand and uses only one window to provide full control over its functionality. Typical applications are uploading weather station data, webcam images, or any other data from a PC to a webserver. Cross Platform functionality, macOS, Windows, Linux. Message window: The black message window shows the activity of the FTP scheduler and provides information to the user concering current activities, connection progress, retries, uptime and total amount of uploaded or downloaded files. Watchdog: The watchdog timer will end the FTP session after the given amount of minutes has been reached. This function is useful when working with unreliable FTP servers or internet connections (like the cellular network). FTP Server, port, login, password: The FTP parameters required to connect to the FTP server. The FTP password is not visible and will be stored in an encrypted format. Proxy server, port, username, password: Should you be working in an environment with a proxy server, you need to provide the proxy details here. The proxy password is not visible and will be stored in an encrypted format. Proxy support is provided for http, https and the socks protocol. Local path: The path on the local machine which contains the files to upload, when downloading the destination directory for the files to download. Proxy mode: Support for http (port 80), https (port 443) and socks (port 1080). You can specify your own portnumbers. Append: When uploading files the uploaded files will be moved to a backup directory on the local machine and appended. This is useful when uploading ascii data to a FTP server. When downloading the downloaded files will be appended. Delete: After upload delete the uploaded file from the local machine. After download delete the file from the FTP server. Schedule: By enabling the scheduler you can delay upload or download sessions to a future date and time. 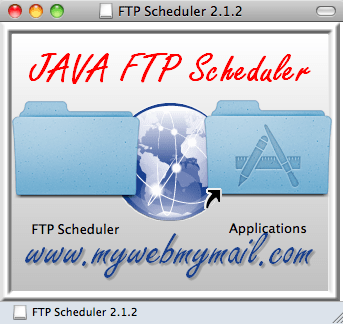 Stability: The JAVA FTP Scheduler has been designed to provide a stable automated FTP solution. Should an upload or download fail a retry attempt will be made the next time the session is active. Network failures have no effect on the stability of the scheduler. 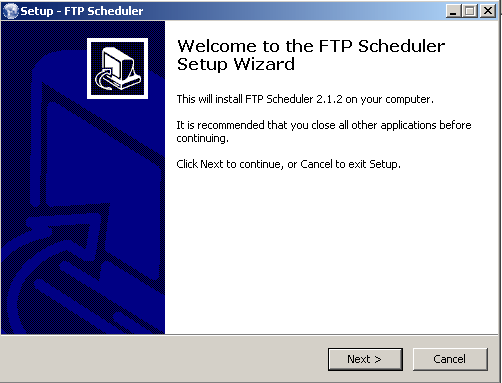 The FTP Scheduler uses a minimum of resources and CPU cycles. Email to/from: Provide an email address here to receive a message with the error log in case the FTP Scheduler encounters an error. Emails will be limited to 1 per hour. SMTP server/port: The SMTP server address and port. TLS/SSL is supported (for example gmail). SMTP login details: The user account on the SMTP server, user login and password. Email button: Test the email functionality (works only when full Email/SMTP details have been entered). Color button: Change the text color in the message window. File Menu option “Open error log”: Opens and displays the most recent error log from the error log directory. File Menu option “Open session log”: Opens and displays the session log. FTP Menu option “Interrupt session”: Stops the currently active FTP session. Other improvements in 2.1.2: Uniform absolute form layout, maintains appearance across O/S platforms. Button to select local path from file browser window. Now operates in the background without grabbing focus on Windows systems, the Apple OS X version remains unchanged (version 2.1.2). Bug fix which prevented editing textfields on first-time installations, the Apple OS X version remains unchanged (version 2.1.2). Site to Site transfers: The FTP Scheduler does not support direct site to site transfers (fxp), however you are able to create a download session to download the files to the local machine and an upload session to upload the files to a remote machine. By selecting the ‘delete’ option for the upload session the files will be deleted from the local machine after a successful upload. Select the File Types tab. In the Registered File Types list, select JAR File.